This formula is a powerhouse supplement that helps to provide the essential nutritional building blocks for a healthy athletic horse. Just ask California Chrome, American Pharoah, and the multitude of Hunter/Jumpers, Dressage, Barrel and competitive horses who have been training and winning on it! As a result, this safe and effective full spectrum supplement is being used by trainers and owners nationwide and is quickly becoming the main stay of the most successful stables. The PLUS added to the Muscle Mass PLUS formulas are condition specific nutrients; a combination of natural, vitamins, minerals, amino acids, antioxidants, herbs, hoof and coat conditioners and naturally occurring Prebiotics to make this a full spectrum supplement formula. Muscle Mass PLUS is a proven natural alternative to anabolic steroids. It does not make a horse "hot" or "on the muscle". This supplement is exceptional for development and bone growth in yearlings, 2 year olds in training and prepping sale horses. Also for horses in short term layups, to help retain muscle tone. 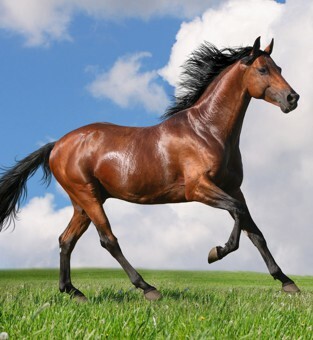 Muscle Mass PLUS: This improved formula addresses the problems, the symptoms and the nutritional maintenance needed to keep the competitive horse healthy, by integrating high quality Amino Acids, Vitamins, Minerals and powerful Herbs, such as Cordyceps. Cordyceps are the "International Athlete's Edge" for speed, strength, endurance and energy. Cordyceps also increases oxygenation, improves immune strength and helps horses adapt to constant environment and altitude changes. • Anti-inflammatories, to help prevent the main cause of pain, inflammation. • Anti-oxidants, to help prevent free radical damage from stress and carbon monoxide when trailering.